1 of 8 Rub pork with steak seasoning. 2 of 8 Place pork in slow cooker bowl. 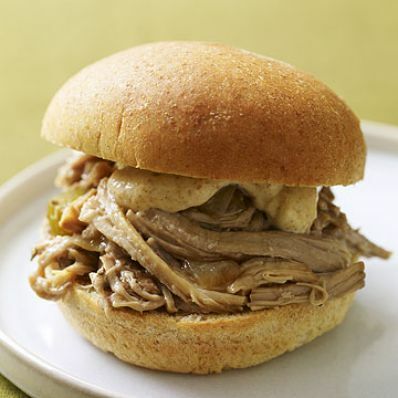 Scatter onion and celery around pork and pour 1/4 cup of the vinegar over top. Cover and cook on HIGH for 6 hours or LOW for 8 hours. 3 of 8 Remove pork from slow cooker and cut into chunks. Let stand until cool enough to handle. 4 of 8 While pork is cooling, strain contents of slow cooker over a fat separator, setting vegetables aside. Pour defatted liquid into a small saucepan. 5 of 8 In a small bowl, stir together remaining 2 tablespoons vinegar with cornstarch. Bring defatted liquid to a boil over medium-high heat. Whisk in vinegar mixture and 1 tablespoon of the Cajun seasoning. Boil 1 minute, or until thickened. 6 of 8 Using two forks or your hands, pull pork into shreds, discarding excess fat. Place meat in a bowl and stir in vegetables. Add thickened liquid and toss to combine. 8 of 8 1 tablespoon spiced mayo.